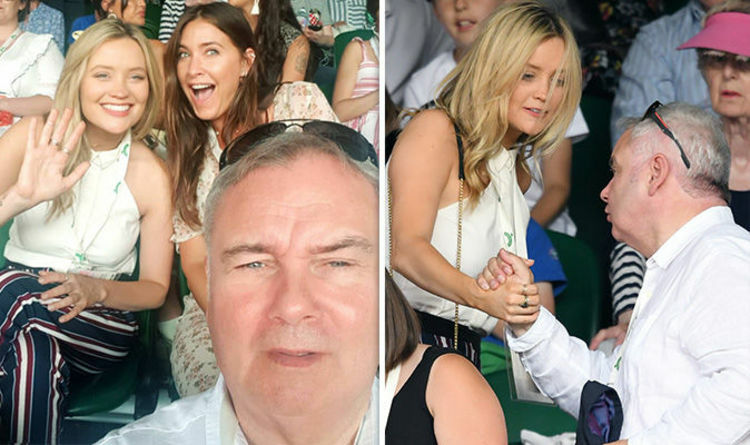 The This Morning host, 58, joined the likes of Laura Whoitmore and Lisa Snowdon at the tennis and snapped a picture of the pair of beauties sat behind him in the stands. Taking to Instagram to share the selfie with his 389,000 followers, he could be seen squinting in the sunshine as Laura, 33, and Lisa, 46, smiling and waving for the camera in the row behind. “One of the downsides to being me is being stalked by amazingly attractive women who just don’t respect how shy I am,” he joked in the caption. Celebrities including TV presenter Laura, former Made in Chelsea star Lucy Watson and boxer David Haye made an appearance at Wimbledon yesterday and enjoyed refreshments at the Robinsons suite. Lucy, 27, was even visible in the background of Eamonn’s picture. With the order of play including Roger Federer, Juan del Potro and Novac Djokovic, they looked to be enjoying the continuation of the Men’s Singles whilst soaking up the sunshine. They were joined by Dec Donnelly and his wife Ali Astall, who showed off her blossoming baby bump in a floral patterned frock. The couple, who are expecting their first child in September, looked smitten as they were snapped sharing a tub of ice cream in their seats. Meanwhile, today’s order of play sees Serena Williams go up against Italy’s Camila Giorgi, Kiki Bertens take on Julia Görges, and Daria Kasatkina and Angelique Kerber, Dominika Cibulkova and Jelena Ostapenko face each other as the Women’s Singles continue. Strictly Come Dancing professional Karen Clifton was among those who attended. Looking stylish in a blue and white striped summer dress, she kept cool in the light number which featured a cut-out to show off her toned midriff. Karen, 36, paired the outfit with comfortable sandals and wore her ombre golden tresses in a tousled bob. Also in attendance was former Great British Bake Off judge Mary Berry. The 83-year-old TV cook put on a stylish display in a blush pink tailored dress which fell to below her knees, adding matching court shoes with a low wedge heel. She accessorised with a co-ordinating pashmina and clutch bag, with a beaded necklace giving a glamorous touch.